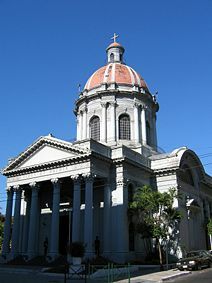 Asunción (full name: Nuestra Señora Santa María de la Asunción), a city of 512,112 (1,858,000 in its metropolitan area), is the capital of Paraguay, home of the national government, principal port, and chief industrial and cultural center of the country. It dominates social, cultural, and economic trends in the nation. 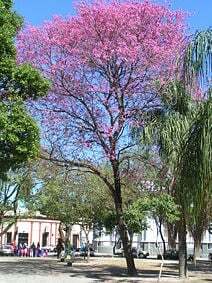 Asunción is a charming city, with beautiful flowering trees and large parks. Its buildings reflect its colonial era. Located where the Pilcomayo River joins the Paraguay River, it served as a gateway to the South American heartland, and was thus crucial to Spain as it colonized the continent. As the city developed along the river bank, fertile land supported the growing population and the city prospered. This city that was founded by Spanish explorers on the feast day of the Assumption in 1537, is the capital of a country that has since been devastated by wars, civil war, has been under extended periods of authoritarian rule, underwent two military coups, has drifted through a lengthy period of economic stagnation, and was under international scrutiny for human rights abuses in 2008. While Paraguay remains one of the poorest nations in Latin America, it has made significant progress since the 1990s. It elected its first civilian president in over 40 years, re-wrote its constitution and has seen an upswing in the economy due to rapid growth in the export of soybeans and meat products. In recent decades Asunción's tourist trade has increased. Considered a gateway to the Gran Chaco, the city has a pleasant, tropical climate and its stabilizing political and social situation has allowed its doors to open for visitors once again. The name of the city, Asunción, refers to the Assumption of Mary; the full name means Our Lady, Holy Mary of the Assumption. It was given this name when a stockade was completed there on the Feast of the Assumption (August 15) in 1537. The city is located where the Pilcomayo River joins the Paraguay River, upon a promontory 141 feet (43 meters) above sea level on the left bank of the Paraguay. In the northwest, the Paraguay River separates the city from the Occidental Region of Paraguay, and in the south of the city, from Argentina. The rest of the city is surrounded by the Central Department. 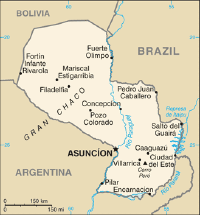 Asunción's land area totals 45.2 square miles (117 square kilometers). The climate of Asunción can be described as warm and humid for most of the year. The average temperature is 75.2°F (24°C), with an average maximum of 84.9°F (29.4°C), and an average minimum of 66.6°F (19.2°C). In 2002, the registered rainfall was 55.9 inches (1420 mm), with most falling in October, and the least in September. The city is spread out on gentle hills in rectangular blocks. Places like Cerro Lambaré (a hill) located in Lambaré has numerous lapacho trees which are spectacular in the spring. Parks like Parque Independencia and Parque Carlos Antonio López have big areas of Paraguayan hardwood forest. There are several small hills, such as Cabará, Clavel, Tarumá, Cachinga, Tacumbú, among others. Neighbourhoods are called "barrios." An environmental issue for Paraguay concerns inadequate means for waste disposal, which poses health risks for urban residents. Paraguayan president and dictator Francisco Solano López. Alfredo Stroessner with Argentina's Juan Perón. Asunción, known as the "Mother of Cities," is one of the oldest cities in South America. It was from there that the colonial expeditions departed to found other cities, including the second foundation of Buenos Aires, Villarrica, Corrientes, Santa Fe and Santa Cruz de la Sierra. The first European visitor to the area may have been conquistador Juan de Ayolas, who died in 1537. Nuestra Señora de la Asunción (Our Lady of the Assumption), was founded on the feast day of the Assumption on August 15, 1537, by Spanish explorers Juan de Salazar (1508-1560) and Gonzalo de Mendoza. Jesuits established mission settlements on the Paraná River, a tributary of the Paraguay River, in 1588. In 1603, the First Synod of Asunción, which set guidelines for the evangelization of the natives in their lingua franca, Guaraní, was held there. For a time, Asunción was important to the Spanish colonial administration, offering access to the South American heartland from the Atlantic coast, up the Río de la Plata, and then up the Río Paraguay. The city became the center of a large Spanish colonial province comprising part of Brazil, present-day Paraguay, and northeastern Argentina: the "Giant Province of the Indies." Asunción developed along the river bank. To the east of the river, fertile land supported the growing population. Buildings from the colonial period attest to the prosperity of the city. In 1731, a failed uprising under José de Antequera y Castro (1690-1732), a Spanish lawyer and judge in Peru, was one of the first rebellions against Spanish colonial rule. In 1767, Jesuit missionaries were expelled. Paraguay declared its independence after overthrowing the Spanish Governor Bernardo de Velasco on May 14, 1811. Secret meetings between independence leaders were held at the home of Juana María de Lara in downtown Asunción. Lara's home came to be known as Casa de la Independencia (House of the Independence) and serves as a museum and historical building. After independence, under the presidency of Gaspar Rodríguez de Francia (1766–1840), who ran the country with little outside influence from 1814 to 1840, roads were built and the streets were named. However, it was while Carlos Antonio López (1790-1862) was president, from 1844 to 1862, that Asunción (and Paraguay) progressed. The new president built more than 400 schools, opened metallurgic factories, and built the first railroad service in South America. 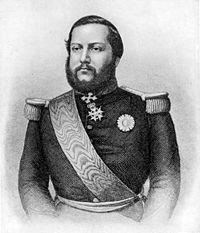 However, his son Francisco Solano López (1826-1870) became president and led the country through the disastrous War of the Triple Alliance (1865-1870). That war, which caused more deaths than any other South American war, was fought between Paraguay and the allied countries of Argentina, Brazil, and Uruguay. Asunción was captured in 1868, and occupied by Brazilian troops until 1876. The war had a devastating, long-term effect on Paraguay. In addition to losing 55,000 square miles (142,450 square kilometers) of productive territory in the southeast and northeast, the government had to sell many of its assets to pay reparations. Nearly half the population was lost; those who survived were mostly women and children. After occupation, Paraguay went through a period of authoritarian rule, war with Bolivia from 1932 to 1935, a military takeover in 1936, and civil war in 1946. Alfredo Stroessner (1912-2006) took over in 1954, and ruled as a virtual dictator until 1989, during which time Paraguay became progressively isolated from the world community. 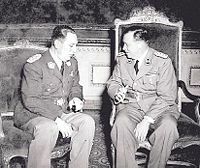 On February 3, 1989, Stroessner was overthrown in a military coup headed by General Andres Rodriguez, who won the presidency in elections held that May. Rodriguez instituted political, legal, and economic reforms and initiated a rapprochement with the international community. A new constitution in June 1992 established a democratic system of government and dramatically improved protection of fundamental rights. Battle of Tuyutí was the bloodiest battle in the history of South America. 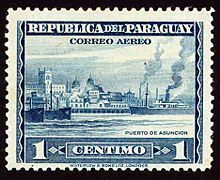 A stamp showing the port of Asunción. Paraguay is a constitutional republic, with a popularly elected president, and a bicameral Congress consisting of an 80-member Chamber of Deputies and a 45-member Senate. The country has a multiparty electoral system, but the Colorado Party governed for 60 years. Asunción has a mayor and a city council. The Asunción Capital District is a subnational entity in Paraguay not part of any of the 17 departments. 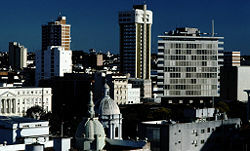 The city of Asunción serves as both the capital of the nation and of the Capital District. Paraguay has had a history of human rights abuses. A 2008 United States Embassy report notes unprosecuted killings by the police and military, prisoners subjected to torture, overcrowded and violent prisons, corruption, inefficiency, and external interference in the judiciary, endemic government corruption, violence and discrimination against women and indigenous persons, trafficking in persons, among other abuses. Traditional buildings in Calle Palma. Paraguay has a predominantly agricultural economy, with a struggling commercial sector, a large informal sector, and a large subsistence sector. There is sizable urban unemployment and under-employment, and a large underground re-export sector. The country has vast hydroelectric resources, including the world's largest hydroelectric-generation facility, the Itaipú Dam, built and operated jointly with Brazil, but it lacks significant mineral or petroleum resources. Paraguay's per capita GDP was $U S4,500 in 2007, having stagnated since the 1980s. Political uncertainty, corruption, limited progress on structural reform, and deficient infrastructure, has all been blamed. Asunción has always been the center of the economic activity in Paraguay, mainly due to the location of all the national governing bodies there, and is the main distribution center. Industries in the city process cotton, sugarcane, corn, flour, tobacco, fruit, vegetable oils, and cattle products. The river city is the location of the production of small river craft, as well as textiles and footwear. Freight is transported on foreign-owned river steamers. A river terminal is located in the downtown area of Asunción. A good metropolitan bus service is used heavily. The main long-distance bus terminal is on the Republica Argentina Avenue. Asunción is served by the Silvio Pettirossi International Airport located in Luque, a satellite city of Asunción. The airport is named after Paraguayan aviator Silvio Pettirossi. It was formerly known as Presidente General Stroessner Airport, after Paraguay's former dictator. The population of Asunción city proper was approximately 512,112 people in 2002. The metropolitan area, named Gran Asunción, which includes the cities of San Lorenzo, Fernando de la Mora, Lambaré, Luque, Mariano Roque Alonso, Ñemby and Villa Elisa, had a population of 1,639,000 inhabitants in 2002. Roughly 30 percent of Paraguay's six million people live within Greater Asunción. Sixty-five percent of the total population in the city were under the age of 30. Asunción's population increased greatly as a consequence of internal migration—at first because of the economic boom in the 1970s, and later because of economic recession in the countryside. The adjacent cities in the Gran Asunción area such as Luque, Lambaré, San Lorenzo, Fernando de la Mora and Mariano Roque Alonso have absorbed most of this influx due to the low cost of the land and easy access to Asunción. The city has ranked as the least expensive city to live in for five years running by Mercer Human Resource Consulting. About 95 percent of the people are mestizos of mixed Spanish and Guaraní Indian descent. The remainder of the people are white, unmixed Amerindian (one percent), and Asian (Chinese, Taiwanese, and Japanese Okinawan) (two percent). About 75 percent of all Paraguayans can speak Spanish. Guaraní and Spanish are both official languages. Small groups of ethnic Italians, Germans, Japanese, Koreans, Chinese, Arabs, Brazilians, and Argentines settled in Paraguay and have retained their respective languages and culture, particularly the Brazilians. Paraguay is predominantly Roman Catholic (89.6 percent), Protestant 6.2 percent, other Christian 1.1 percent, other or unspecified 1.9 percent, none 1.1 percent, according to the 2002 census. Asunción's literacy rate is 95 percent, the highest in Paraguay. The number of schools has doubled since 1982, creating many new jobs for teachers. Student numbers have doubled since 1962. The best known public schools are the Colegio Nacional de la Capital (founded in 1877), the Colegio Presidente Franco, and the Colegio Nacional de Niñas (a girls-only school). The best known private schools are Internacional, Colegio San José (Catholic school), American School of Asunción, Colegio Dante Alighieri (Italian private school), Colegio Goethe (German school), and Colegio San Ignacio de Loyola. The main universities are the Universidad Católica Nuestra Señora de la Asunción (private Catholic University) and the Universidad Nacional de Asunción (state-run). 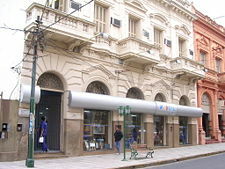 Privately run universities include Universidad Americana and Universidad Autónoma de Asunción. Former train station in Asunción, in 2006 serving as rail museum. Asunción is home to the Godoy Museum and the Museo Nacional de Bellas Artes (which contains paintings from the nineteenth century), the Church of La Encarnación and the Cathedral, and the Panteón Nacional de los Héroes, a smaller version of Les Invalides in Paris, where many of the nation's heroes are entombed. Other landmarks include the Palacio de los López (presidential palace), the old Senate building (a modern building opened to house Congress in 2003), the Catedral Metropolitana and the Casa de la Independencia (one of the few examples of colonial architecture remaining). Calle Palma is the main street downtown where several historical buildings, plazas, shops, restaurants and cafes are located. The "Manzana de la Rivera," located in front of the Presidential Palace is a series of restored traditional homes showing the architectural evolution of the city. The old railway station still maintains the old trains that are used in tourist trips to the cities of Luque and Areguá. The biggest shopping malls are Shopping del Sol, which includes a Macy's-style department store, Mariscal Lopez Shopping, Shopping Villa Morra, in the central part of the city, and the downtown-located Mall Excelsior. The nightlife revolves around the downtown part of the city and in the neighborhoods of Manora and Las Carmelitas, a strip full of nightclubs and bars. Football is the main sport in Paraguay, and Asunción is home to soccer teams including Olimpia, Cerro Porteño, Club Libertad, Club Nacional, Club Guaraní, and Club Sol de América. The Defensores del Chaco stadium is Paraguay's main football stadium of the country and is located a few minutes away from the center of Asunción. CIA World Fact Book. Paraguay Retrieved July 17, 2008. Encyclopaedia Britannica Online. 2008. Asuncion Retrieved July 16, 2008. This page was last modified on 6 February 2019, at 20:20.